Marie Vander Top was born on December 9, 1921 to John and Grace (De Vries) De Kruif near Maple Lake, Minnesota. She moved with her family to Chandler, MN in 1928. She was baptized and professed her faith in the Chandler Reformed Church. On November 10, 1944 she was united in marriage to Jake Vander Top. They farmed in the Edgerton area until Jake’s death in 1984. 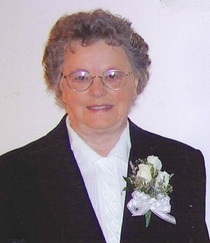 Marie lived in Chandler, MN until 2008, and then lived in the Edgebrook Estates Assisted Living until her death. Marie loved the Lord and was active in church activities. She loved to play cards, board games and socialize with her friends. Marie is survived by her children, Glenn (Connie) of Eden Prairie, MN, Loren (Alanna) of Edgerton, MN and Mary Ann (Luther) Schramm of Watertown, MN. She is also survived by her grandchildren, Greg (Melissa) Vander Top, Chad (Laura) Vander Top, Sara (Jon) Bryant; Jill (Troy) Talsma, Lisa (Doug) Brands, Deanna (Todd) Hopkins, Angela (Eric) Johnson, Melanie (Mark) Baumhover, Lynnsie Schramm, Alexander Schramm and Anthony Schramm and 23 great grandchildren. She is also survived by three brothers, Bill De Kruif, Hank (Adrianna) De Kruif and John (Vi) De Kruif; five sisters, Jo (Marvin) De Groot, Wilamena Schoolmeester, Grace Vande Brake, Evelyn (Wallace) Runia and Faye (Arnold) De Kam. She was preceded in death by her husband, Jake, her parents, John and Grace, two sisters, Jennie and Elsie, and one grandson, Scott Vander Top. Services for Marie Vander Top are Wednesday, December 20, 2017 at 11:00 AM at the Chandler Christian Reformed Church. Interment will be held prior to the service at the Chandler Memorial Cemetery. Pastor Josh Christoffels, officiating; organist, Julie Reitsma. Pallbearers are Chad Vander Top, Greg Vander Top, Alexander Schramm, Troy Talsma, Douglas Brands and Todd Hopkins. Visitation Tuesday, December 19 at the Chandler Funeral Home from 6:00 - 8:00 pm.